Ever since my kids were babies we’ve been on the road traveling with them. My in-laws live in Pittsburgh, which is a 10 hour drive from Rhode Island – so as you can imagine – my kids have been used to road trips for years. I actually don’t think they think there’s any other way to travel! Road Trip Games for Kids has been my saving grace throughout the years. My. Saving. Grace. I have an arsenal (full) of road trip games for kids that I know by heart and keep on hand that has truly been our traveling lifesaver. 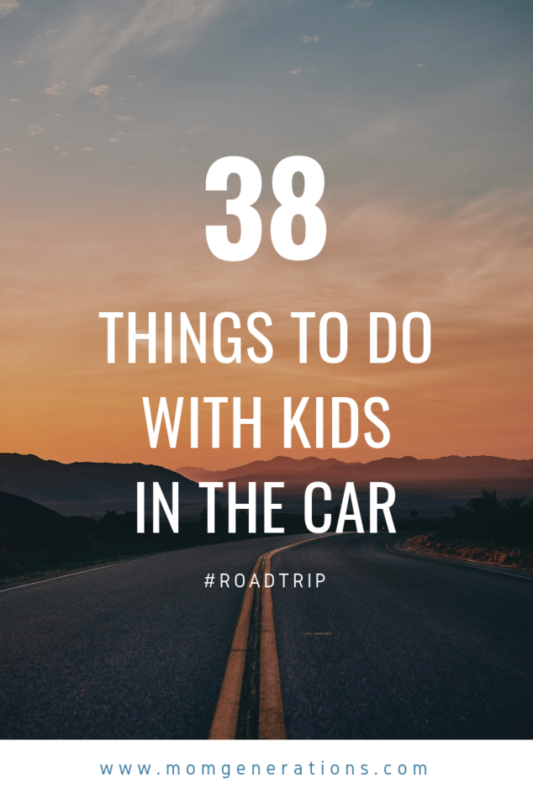 I have one rule in the car when it comes to traveling with the kids – you cannot say the dreaded words – “I don’t have anything to do.” With the creation of mobile technology for our kids today, there’s always something to do. Whether they’re watching a DVD, playing on an iPad or tuned into their phones – there’s ALWAYS something to do. When I was a kid, it wasn’t that way at all. I mean – Road Trip Games for Kids nowadays is Fortnite on their phones. I’m being mad real here. I grew up traveling a ton with my family – we never had a ton money – so we ALWAYS were traveling by car. Road trips were the only way to go. We drove to Florida. We drove to Maine. We drove to Canada. We drove EVERYTHING! Road Trip Games for Kids were our saving grace, too. With no technology – we really needed to rely on games. Games were it (or napping). We relied on Road Trip Games for Kids (as did my parents!). Just like you would plan out a trip with packing and traveling and planning hotels, etc. I plan out the drive. It’s MY domain because my husband is usually driving, so I need to make sure I keep the kids occupied. For me – what works? I love to jot down a bunch of different games that we can play. Not 2 or 3… you need to PLAN, especially if you have little ones. I have 10-12 things ready to go throughout the entire trip. And that’s not including snack time, too! So take the time to plan things out and not just toss things together last minute. I’m here to help! This is a fun game to play! You start with the letter A and go to Z… everyone comes up with something that would start with their designated letter that you would bring on a picnic – Apples… Bananas… Carrots… Donuts… and so on. Kids get a kick out of this one! You need about 5-6 people to play this one. Someone comes up with something silly and whispers it to the next person in the car. Then that person whispers it to someone else. You’re not allowed to ask “What did you say?” You just have to repeat what you heard. This is a great Road Trip Games for Kids because it keeps kids engaged with each other, too. This one is pretty straight forward – if you’re working on letters with your kids, this is a really great game! But who am I kidding – my older guys love this game, too! You just see how quickly you can fly through the Alphabet. Again – pretty straight forward. I usually print out a list of all the states so the kids can cross off as we go! I will have to create a printable of this for people! Always a hit in our car! We sing any song that the kids want to sing! This is my favorite because I play MY music and the kids love it! ONE person picks something that they’re thinking about… it can be a person or a place or a thing. Everyone gets to ask 1 question and you go round and round (up till 20 questions) to see if anyone gets it. This is super fun to play with kids! I try to sometimes just make it about the cars, but it can be ANYTHING! We always get hung up on orange, yellow and purple! See how long it takes you to go through the rainbow! Think of 1 thing that would be semi-hard to find in the car or out of the car. Then say it and see who finds it first. My sons get uber competitive! Round Robin! Start a story and see where it goes! My kids used to love playing this when they were kids. I used to let everyone have 1 full minute to share a piece of the story. I love these kinds of Road Trip Games for Kids because everyone gets a chance to add something in! I mean – who doesn’t love a good staring contest!? LOL! This is always a riot! Try to make someone laugh in the car! This always used to crack my kids up! I would say lyrics to songs that they knew to see if they could figure out what I was saying! My older brother used to do this one with us as kids. Just find a tune and hum… see who can figure it out! That’s right – clap out a tune! Try it – it’s HARD! Have some fun asking questions to see if your kids remember things. For example – your birthday, their 1st preschool teacher… ask age appropriate questions! Easy game, but so much fun for the little ones! My kids LOVE these kinds of Road Trip Games for Kids because everyone can play – even little ones! Kind of like the “I Spy” game! Points for the person who finds the most! Again – “I Spy” type of game! Keeps kids engaged! This is one my kids always love to play because they want us to STOP! LOL! Take down the times on a piece of paper to see who is the closest. This used to be a fun one to play when the kids were little because it would make them have to look at other drives and see who was driving. We would always try to guess as we were pulling up! My son William used to ALWAYS do this as a kid. It was never a game, but he would always wave to cars as they drove by and it was always cute to see another kid wave back! Have one person start and see how far they can go with it! I would suggest giving a time limit to the game, too! So in 60 seconds see how many you can name! Bring a Deck of Cards – WAR, Go Fish, etc. One thing we ALWAYS have on hand for long car rides! Another game we ALWAYS have on hand for long car rides! I love bringing a paper and pen for the kids to play these kinds of games, too! I used to play this all the time with my little sister on car rides! You remember this one – Mansion – Apartment – Shack – Home and then you fortune tell out the life you’re supposed to have! This was a fun game! I loved doing this when the kids were little. They would all be quiet and listen. For this one you can get car sick, so beware! Again – an oldie, but a goodie! You can buy online or in mass retailers! Everyone can ask questions about it until someone “hits” it! I love playing this with my middle schoolers. You see how many states and capitals that they know. You can start by seeing license plates and go from there! Jot down on a piece of paper all the states and start listing who you know in each state! This is a great thinking game! Identify your car and then count how many other people you see driving a car JUST like yours! This one requires some TLC from mom or dad! Come up with a Scavenger Hunt INSIDE the car. Hide little treats. Have Mystery Bags ready to be opened at certain times. Have fun rest stops already planned. The entire trip is a fun mystery trip! Classic, right? My brothers used to love to play and love to win! Also – beyond – Road Trips Games for Kids – I love to write about things to do with your kids!